Following on directly from The Desolation of Smaug, Peter Jackson kicks straight into the action with the final installment of The Hobbit trilogy. This sad farewell to the dwarves, wizards, elves and other inhabitants of Middle-earth provides grand spectacle and gets off to a cracking start; we rejoin our heroes as they madly flee Smaug, the fire-breathing dragon. The dwarves have set up camp at the Lonely Mountain but Thorin (Richard Armitage) has been consumed with greed, otherwise known as dragon-sickness, and is drunk on power. His descent into madness and search for the Arkenstone has terrible repercussions and marks the start of a great war, which sees different factions rallying together to overcome one evil. Jackson focuses on the casualties, price and aftermath of war in keeping with the novel's themes. However, the added narratives of Legolas (Orlando Bloom, whose glowing CGI face is plain scary) and Tauriel (Evangeline Lilly) are overkill, and come at the expense of time with our protagonist Bilbo (Martin Freeman). We're also presented with the ongoing struggle between bravery and cowardice via Bard (Luke Evans, turning in a terrific performance) and Alfrid (Ryan Gage), scenes which attempt comic comment but come off as rather too slight. The middle section flags due to the relentless padding, yet the film features standout moments of spirited action and its most exhilarating battles bring to mind the greatness of the Lord of the Rings trio. Enormous earthworms, terrifying orcs and a red-haired Billy Connolly slug it out and the attention to detail is impressive. Nevertheless, the finale - and indeed the entire Hobbit trilogy - still pales in comparison to Jackson’s previous Middle-earth adventures. 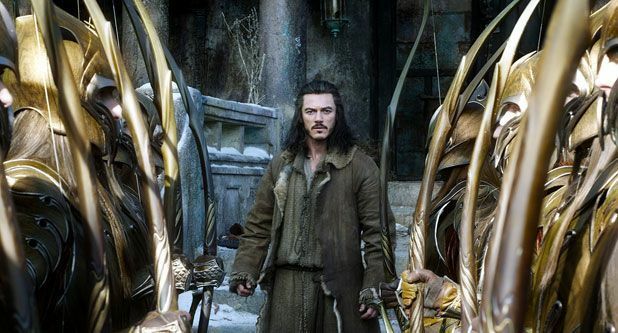 General release from Fri 12 Dec.
Smaug's on the rampage, Thorin is consumed with greed and war breaks out. The final instalment of Jackson's Middle-earth adventures features moments of spirited action and some terrific performances, but like the other Hobbit films it pales in comparison to the episodes of the previous trilogy.